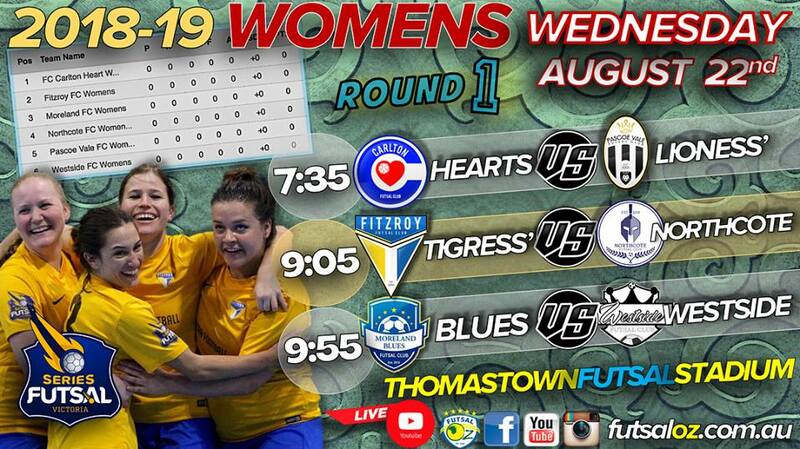 First game for season 2018/2019 for Series Futsal Victoria Womens league. Carlton take on Pascoe vale both teams looking to start their season with a win. Carlton get the first goal for the same three minutes in. Pascoe vale continue to press hard and create scoring opportunities. They struggle to find the back of the net. With both keepers kept busy and the ball being turned over constantly it made for an interesting game. Both clubs pushing hard and having shots they both struggle to get reward for effort. Finally after continues shots on goal Carlton able to score their second goal for the half. Going into half time with a 2-nil lead. Second half resumes and both teams come out firing. Pascoe searching for their first goal and Carlton searching for their third. Neither team able to have shots on target. With multiple shots going either over the net or straight to the keeper. Two players receiving yellow card brining the intensity of the game higher and more exciting. With four minutes remaining in the half and still no goal scored in this half. With two minutes remaining Carlton able to find their third goal. Seeing them win 3-nil. Fitzroy looking to start this season the way they left the last with a win over the new comers Northcote. Fitzroy get the first two goals for the game, really putting the pressure on the new comers. But Northcote dig deep and don’t let the lead phase them. Going on to score themselves, their first goal for the season. Fitzroy hit back and score another 2 goals to extend their lead and give them a 3 goal advantage. Fitzroy’s pressure allows them to have control of the ball and have majority of the possession in their forward half. Fitzroy really getting a spread of goal kickers in this first half. With all five goals scored from five different players. A solid team effort. With four minutes in the half remaining Dharma Georgi able to score her second goal for Fitzroy. Second half under way and Northcote reply quickly with a quick goal. Helping them keep motivation to stay in the game and reduce the 5 goal lead. Emily Coppock replies quickly for Fitzroy to score her third goal. Fitzroy extend their lead out to nine goal lead. With eight minutes remaining Fitzroy making it to hard for Northcote to come back from. With 40 seconds remaining Fitzroy score their 16th goal for the game. Westside new comers to Series Futsal really put it up to Moreland in the first half. Westside able to get the first goal of the game to start their season on a good note. Moreland needed a quick reply and they got it. Game level anyone game early in the first half. Westside respond and go on to score two quick goals with eight minutes remaining in the first half. Moreland able to find their second goal in the first half to reduce the lead back to one goal. With the ball constantly getting turned over a very intense game to end the first round. At half time Westside lead 3-2. Westside come back firing in the second half. Getting two quick goals five minutes into the first half. To extend their lead out to three goals. Making it harder for Moreland to come back from. Moreland able to score their third for the game but in west side style. They reply with a quick goal. To keep their three goal lead. Both keepers were kept busy late in that second half. Westside come away with their first win for the season.